Jake Allen made 22 saves, Ryan O'Reilly scored his first goal with St. Louis, and the Blues beat the Toronto Maple Leafs 4-1 on Saturday. The Leafs have lost back-to-back games for the first time this season following five consecutive wins. Pucks were flying in for the Toronto Maple Leafs through seven games, with a couple of the final scores looking like something out of the 1980s instead of 2018. They're quickly learning that nothing comes easy for very long in today's NHL. 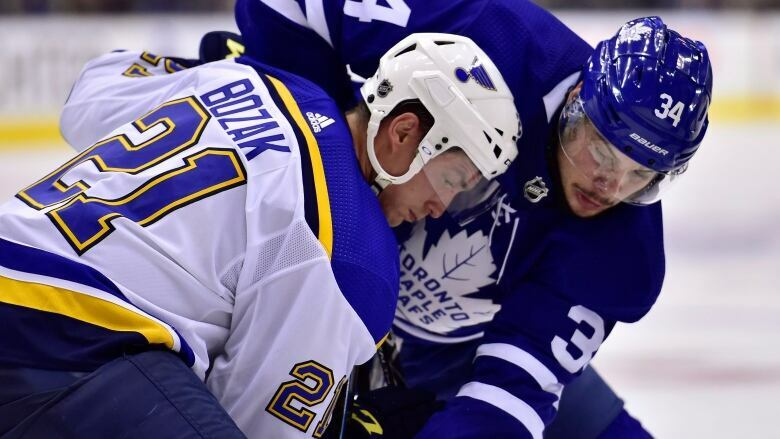 Jake Allen made 22 saves and Ryan O'Reilly scored his first goal with St. Louis as the Blues ground out a 4-1 victory over Toronto on Saturday. The visitors kept the Leafs to the outside much of the night — Toronto had just eight shots through two periods — in handing the pre-season Stanley Cup favourites a second consecutive loss following five straight wins. "We scored early, we scored easy, it was pretty loose and everything was great," Leafs head coach Mike Babcock said of his team's league-high 33 goals in starting 6-1-0. "Now we're finding out it's the NHL, it's hard to score, teams compete hard on you, teams adjust and they're going to play you hard. We've got to get our mojo back by going to work and we'll do that." Robert Bortuzzo, Zach Sanford and Ivan Barbashev, into an empty net, had the other goals for St. Louis (2-3-2), which picked up just its second victory of 2018-19. David Perron chipped in with a pair of assists, while O'Reilly had another for a two-point night. Morgan Rielly replied for Toronto (6-3-0). Frederik Andersen stopped 21 shots for the Leafs, who were shut out 3-0 by the Pittsburgh Penguins on Thursday. "There have been some adjustments by our opponents," said Toronto centre John Tavares, who finished with two shot attempts. "We have to stick to what we do well and can't get away from it. Toronto beat the Los Angeles Kings 4-1 on Monday but, after getting blanked by Pittsburgh and being held of the scoresheet through two periods Saturday, went 116 minutes 37 seconds without a goal until Rielly cut the Blues' lead to 3-1 early in the third. The Leafs had 23 of their 64 shot attempts blocked by the Blues, while 18 missed the target. NHL scoring leader Auston Matthews, who had seven multi-point games to start the season, had 11 shot attempts, including six on target, but couldn't find the range. "They were on the inside, they backchecked, they worked hard," Babcock said. "We stayed on the outside, never got the puck to the net, never got inside. "They worked hard and they competed harder on the puck, in the hard areas, and we turned the puck over." Tavares said improving the Leafs' breakout is the first step to getting back on track. "Being a little bit cleaner and allowing us to use our speed and get on the forecheck and be tenacious and hungry for pucks and put pressure on teams and not give them time and space," he said. "They did a good job of slowing it down and protecting the middle of the ice."